In 1989, William Henry Bell, Jr. was convicted of murdering an elementary school principal. Nearly 30 years later, South Carolina's Free Times reports that the reversal of his death sentence because of intellectual disability provides evidence of the death penalty's continuing decline in the state and across the country. At the time of the murder, Bell maintained that he was innocent, but after four days in jail, he confessed to the murder. Prior appeals—including one alleging a pattern of racially discriminatory charging practices in interracial crimes involving black defendants and white victims—failed for 25 years, until a trial judge in November 2016 determined that Bell was ineligible for capital punishment because he had Intellectual Disability. In May 2017, the state attorney general's office decided it lacked grounds to appeal the court's decision, leaving Bell to face resentencing with a maximum penalty of life without parole. Emily Paavola, one of Bell's attorneys, said the case fits into a larger narrative of South Carolina's declining use of capital punishment. “It is increasingly hard to justify retaining the death penalty in South Carolina. Prosecutors rarely seek it, juries more rarely impose it, and even when the rare individual is sentenced to death, the odds are that the defendant will not be executed. We can no longer afford the financial and social costs of such a broken system,” she wrote. The last execution in South Carolina took place in 2011, and since that time only one person has been sentenced to death in the state. 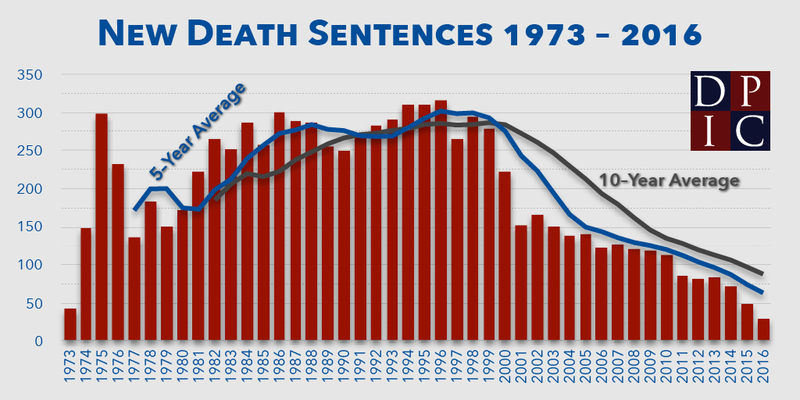 Similar declines have occurred nationwide, with death sentences and executions both dropping sharply in recent years. Fewer people were sentenced to death in 2016 than in any year since states began re-enacting the death penalty in 1973, and executions in 2016 were at their lowest level in 25 years. Florida Governor Rick Scott issued a series of executive orders on April 3 removing locally elected 9th Judicial Circuit State Attorney Aramis Ayala (pictured) from 21 first-degree murder cases and replacing her with 5th Judicial Circuit State Attorney Brad King. The removal comes two weeks after Ayala announced a policy that her office would not pursue the death penalty in murder prosecutions. The cases include a number of potential capital resentencings resulting from the Florida Supreme Court's 2016 decision declaring non-unanimous death sentences to be unconstitutional. Ayala, a Democrat whose district encompasses Orange and Osceola Counties in and around Orlando, said on March 16 that, after conducting "an evidence-based review" of the issue, she had concluded that seeking the death penalty was not cost-effective and "is not in the best interests of this community or in the best interests of justice." Ayala is the only African-American elected prosecutor in Florida. Gov. Scott previously removed her from the high-profile trial of Markeith Loyd, a defendant accused of killing his pregnant ex-girlfriend and an Orlando police officer, also appointing King to handle that case. That decision prompted opposition from the Florida Legislative Black Caucus and the victim's parents. Democratic state Rep. Sean Shaw of Tampa called Scott's action in the 21 cases a "gross abuse of his power." Louis Virelli, a law professor at Stetson University, warned that Gov. Scott's actions set a dangerous precedent, saying, "this opens the door for governors of all political parties to cherry-pick cases away from prosecutors." Ayala has hired Roy L. Austin, Jr., a former civil rights attorney at the U.S. Department of Justice, to challenge Scott's authority to issue the executive orders. Ayala's spokesperson, Eryka Washington, said Scott had not notified the State Attorney that he was issuing the executive orders and that Ayala first learned of the orders from the media. “Ms. Ayala remains steadfast in her position that the Governor is abusing his authority and has compromised the independence and integrity of the criminal justice system,” Washington said. Orange and Osceola Counties imposed a total of one death sentence from 2012-2016. Citrus, Hernando, Lake, Marion, and Sumpter Counties—the predominantly Republican counties that make up the judicial circuit in which State Attorney King was elected—imposed six death sentences during that period. A Florida bill that would require the jury to make a unanimous recommendation for death before a judge may impose a death sentence will head to Governor Rick Scott for final approval, after both houses of the Florida legislature passed it by overwhelming margins. Senate Bill 280 passed unanimously (37-0) on March 9, and the corresponding House Bill 527 passed by a 112-3 vote on March 10. If signed by the governor, the bill will bring Florida into compliance with the Florida Supreme Court's rulings in Hurst v. State and Perry v. State in 2016. Hurst struck down Florida's prior capital sentencing statute, which had allowed judges to impose the death penalty if a majority of jurors recommended death or to override a jury's recommendation of life. Perry struck down an amended version of the statute, which had permitted judges to impose a death sentence if 10 or more jurors recommended death. The Florida Supreme Court also ruled that the unanimity requirement would apply to death-row prisoners whose direct appeals had been decided after the United States Supreme Court's June 2002 decision in Ring v. Arizona, which held that capital defendants had a right to a jury determination of all facts necessary to impose the death penalty. That decision is expected to overturn approximately 200 death sentences, while permitting a similar number of prisoners whose direct appeals had already been completed to be executed despite constitutional violations in their cases. Until recently, three states—Florida, Alabama, and Delaware—permitted judges to impose death sentences on the basis of non-unanimous jury recommendations for death. Non-unanimous cases accounted for more than 20% of all death sentences in the U.S. from 2010-2015 and disproportionately contributed to death-row exonerations. In 2016, the Delaware Supreme Court struck down its state's death penalty statute, holding that death sentences based upon non-unanimous jury recommendations for death were unconstitutional. The change to Florida's law would leave Alabama as the only remaining state in which a judge may impose a death sentence based upon a non-unanimous jury recommendation. A Wake County, North Carolina jury voted to spare Nathan Holden's life on March 3, marking the eighth consecutive capital sentencing trial in the county in which juries had opted to sentence a defendant to life without parole instead of the death penalty. No jury in Wake County has imposed a death sentence since 2007. Prosecutors had sought the death penalty against Holden for murdering his ex-wife's parents and attempting to kill her. The jury convicted Holden of two counts of first-degree murder but, after being presented evidence of 39 mitigating circumstances—including that he suffered from Posttraumatic Stress Disorder as a result of chronic childhood abuse—jurors chose to sentence him to life. Although the ten Wake County prisoners on North Carolina's death row placed the county among the 2% of counties that accounted for 56% of all prisoners on U.S. death rows as of 2013, Wake District Attorney Lorrin Freeman said after jurors returned the sixth consecutive life sentence in February 2016 that it might be time to rethink whether to pursue the death penalty in future cases. Wake County's experience has been typical of North Carolina, and the nation as a whole. The state has averaged fewer than two death sentences per year since 2011, with no new death sentences in 2012 and 2015. In 2016, only one of the five capital trials in the state resulted in a death sentence. By contrast, the state sent between 20 to 30 people per year to death row in the 1990s. The United States has seen a similar drop in death sentences, imposing a total of only 30 new death sentences last year, down from a peak of 315 in 1996 (see graph, click to enlarge). North Carolina's last execution was in 2006.